Sister Corita, described by Ben Shahn as a “joyous revolutionary”, is described by herself as “a nun who taught little children for many years and now teaches big children at Immaculate Heart College in Los Angeles”. Also, however, she was internationally renowned for her serigraphs and her advertising designs for such companies as Westinghouse and Neiman-Marcus. To play is to pray, and to pray is to play, and both are to rejoice in the goodly fellowship of man and god. This is a book of games people pray, of games that can restore life. It is praying through the words and phrases in headlines and ads and footnotes that surround us, and that reveal to us how many carry on the work that God started. Each page is a ticket to the transfiguration of the ordinary, the everyday, the average; and the whole book is a celebration of the concrete and the immediate, of the taken-for-granted realities where alone we can meet ourselves, one another, and our god. 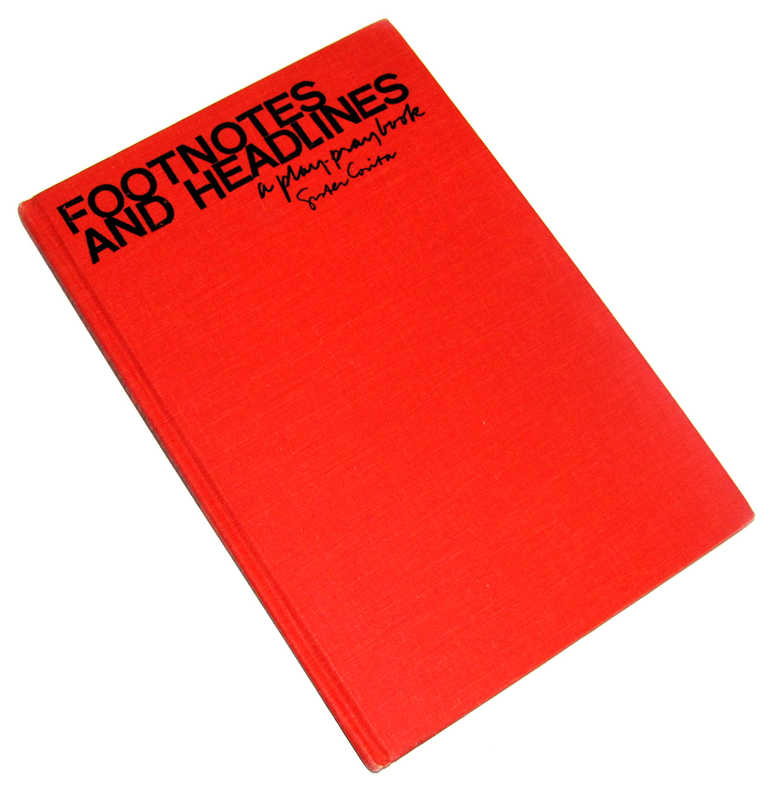 Footnotes and Headlines is for every generation of people in every way of life, of every faith and age, who are turned off by the very idea of a “prayer-book”. This is a serious book for people who refuse to take themselves seriously. Corita Kent (1918 – 1986), aka Sister Mary Corita Kent, was born Frances Elizabeth Kent in Fort Dodge, Iowa. Kent was an American Catholic nun, an artist, and an educator who worked in Los Angeles and Boston. She worked almost exclusively with silkscreen, or serigraphy, helping to establish it as a fine art medium. Her artwork, with its messages of love and peace, was particularly popular during the social upheavals of the 1960s and 1970s. Kent designed the 1985 United States Postal Service’s annual “love” stamp. Her classes at Immaculate Heart were an avant-garde mecca for prominent, ground-breaking artists and inventors, such as Alfred Hitchcock, John Cage, Saul Bass, Buckminster Fuller and Charles & Ray Eames. This was her first book.